Not quite “platinum” but definitely blonder than I’ve been for quite some time……and on the right track, at least (not brassy!!). Fast Forward 4 weeks and it’s time for a root touch up. Actually, at week 3 my roots were really bugging me, but I wanted to wait until week 4. Yeah, I also need a cut, too…. 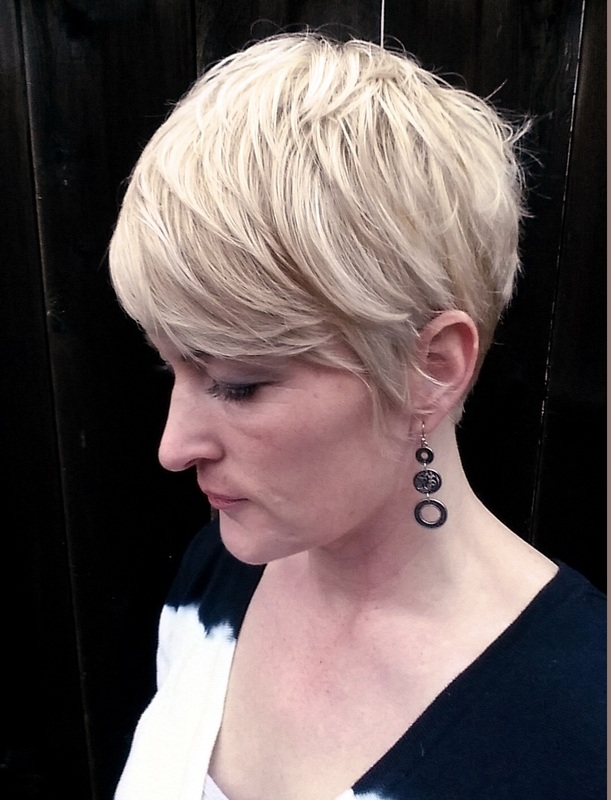 Root Touch Up…..and brief all over bleaching to get whiter. For the bleaching phase, this time I made sure to make enough product! I also added a few ten drops of the Ardell Red/Gold corrector to the mix. Not enough to really make a difference. Just enough to make me feel better, I suppose. Ha! I started at the back of my head first, applying the bleach to the roots only (as best I could), then I moved to the sides, and then the top. By the time I was done applying the bleach, the roots at the back of my head already appeared to be done! Hmmm…. I set the timer for 10 minutes. When I checked my progress, the back and sides looked good, but the roots at the front and top were flaming orange. They would definitely need another 10 minutes. I also wanted to brighten/lighten the overall color of my hair, so I mixed up a half-batch of bleach and applied it to the lengths of my hair, then combed it through. When I was done with that (which probably took nearly 5 minutes) I set the timer for another 10 minutes. Timer went off- and those roots at the front still didn’t seem “done”…. but it also didn’t seem like they were getting much lighter, either. Grrr. I put a piece of saran wrap just over the very top/front portion of my hair- hoping to speed the process somewhat with the trapped heat and set the timer for another 5 minutes. No change. Those front roots were just not going to get as blonde as the rest of my hair. Total processing time = 30 minutes (not counting the initial application time before I set the timer). I rinsed and washed my hair and Wowzers those roots are yellow! I don’t like to use Wella toner right after bleaching because my scalp is usually super sensitive. So instead I opted to make my own toner using the Argon Oil deep conditioner…. …..adding several drops of Ardell Red/Gold Corrector and a giant squirt of my Shimmer Lights violet conditioner- mixing them together into a lovely violet cream. I towel dried my hair, slathered it thoroughly with the violet conditioner…. ….let that set for 8 minutes, then rinsed it out. Sadly, it didn’t seem to make much of a difference….. Still more “yellow” than I want. But you can see how silky soft my hair is! Not damaged at all by the bleaching process. YAY!! I don’t want to do the Wella Toner…..yet…..so I decided to try the Manic Panic Virgin Snow overnight. Slept with it in my hair all night long. The next morning (after showering of course)….um, not much change. Actually, I’d say NO change. Grrrr. And a lot of yellow, too. Gorgeously PLATINUM blonde hair! Yay for the PLATINUM PIXIE!! Here are my notes for my next root touch-up: Do the coconut oil treatment again. Start the bleach application at the top/crown this time, moving forward, then moving down the back, then the sides last. After application, set timer for 20 minutes. Check and evaluate. I “might” comb through (to blend) for the last 5 minutes. Depends. Rinse. Shampoo. Towel Dry. Apply toner (15 volume) to the roots only, setting timer for 8 minutes. Comb through to the ends for another 5 minutes. Rinse, shampoo, shampoo again if too purple, condition with Mystic Divine. What if I WANT Weeds in my Yard? The Perfect Yard..... does it ever really exist?